Again, a look full of retro-ish elements that are done in a completely modern way. Comments on "Patrick De Muynck, Flanders Fashion Institute"
This guy looks fantastic. I love the pocket watch chain in his bottonhole. It's a great way to show off a beautiful accessory (hard to show without a vest). I'm pretty suspicious of claims that "retro" styles are done "totally modern." Thom Brown makes this claim as does Band of Outsiders. This gentleman (who looks fantastic!) certainly doesn't have a retro haircut but everything about him is certainly pretty retro. I'm not so much deconstructing your critique as I am asking what excactly you find so modern about this. certainly not the moderately narrow lapels or the ray bans. As for the chain in lapel, Marcello Mastroianni wore one in "8 1/2". You need the right face for that collar and he has it. He looks great. Patrick is definately one of the best dressed gents in Antwerp ! Well done! This looks really nice. I'm always pleasantly surprised to see Europeans wearing seersucker, as I always thought it was too American, too provincial (i.e. Southern). I like the flat-front trousers and horizontally-striped tie (knit tie?) on this gentleman, but I'm not so keen on the 3-button jacket. Oh...there it is! Hmm, I suppose it works once it's all pieced together. The glasses would be garish (and played out) if it weren't complemented by the dangly lapel jewelery thing-a-ma-jinger. Zachary, you asked what was modern about it, and I dont think its necessarily modern in the sense of having not been done before, but more modern in terms of aesthetic. Look at how much cuff he is showing, how tapered the jacket sleeves are, how crisp he manages to make a knit tie look, not to mention how meticulously the tie is tied (perfect length and line falls nicely on the knot). At least thats my two cents. I think it's the particular fit he's gone for that makes his take on the retro so modern. And I think it definitely works! He looks refined..... in a casual way, of course. That tie is the perfect compliment to the vertical lines of the seersucker. I like the look. Only crit would be the coat sleeves. Too short. Love the look; it's absolutely fabulous. I'd love to cut and restyle his hair though. The patch breast pocket takes the suit to a whole other level - I see those on blazers but never on suits. It's flashy in an understated way. I like the knit tie but its a tad too skinny (but still worth the risk). You can label his style anything you want. He looks great!! Fashionable and individual but in an understated way. Works for me. I love this look. Seersucker is such a great fabric for summer and this guy works it so well. 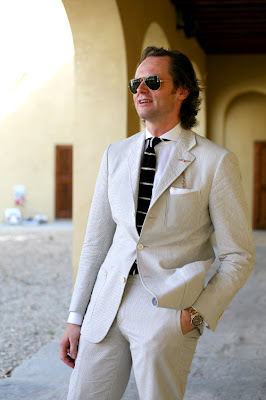 What I really like is that the mix of a casual fabric and a sharp cut of the suit. this is exactly what i would wear tomorrow if i had more money and less worries. he nails it in every detail.